One of the most important reasons to be Heart Healthy is family. 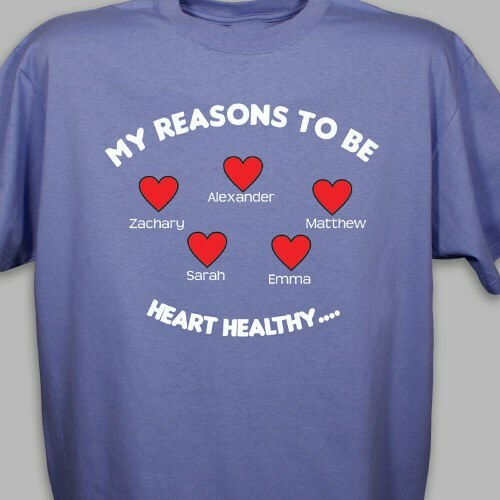 Show how much your family and your health mean to you by wearing this Personalized My Reasons to Be Heart Healthy T-Shirt. It’s a great way for Moms, Dads, & Grandparents to show off their family and helps spread the awareness of Heart Disease. Our Personalized Heart Disease Awareness T-Shirt is available on our premium 100% cotton T-Shirts, machine washable in youth sizes XS-L and adult sizes S-3XL. Includes FREE Personalization! Personalize your Heart Disease Awareness Shirt with up to 30 names. Additional Info Encourage others to become aware with Heart Disease Awareness Walk Shirts & Gear from MyWalkGear.com. Whether you are joining awareness walks or supporting someone you love, you are sure to find a reason to spread your awareness with any of our Heart Disease Awareness Items. Spread Awareness with this eye catching T-Shirt along with our Personalized Reasons to Be Heart Healthy Tote Bag and our Personalized Heart Healthy Sweatshirt as well.